← Thursday after Septuagesima Sunday. Fourth Sunday in Honor of St. Thomas of Aquinas. Posted on February 19, 2017 | Comments Off on Fourth Sunday in Honor of St. Thomas of Aquinas. CONSIDERATION FOR THE FOURTH SUNDAY. St. Thomas’s Indefatigable Ardor in the Search after Sacred Wisdom. FIRST POINT.—Consider the exalted idea that St. Thomas had of divine wisdom. To it he applied the words of the Holy Ghost in the Book of Proverbs: “She hath sent her maids to invite to the tower,” and he declared these maids to be all the other sciences in comparison with that which treats of God. He shows how the different sciences serve partly for the culture of the understanding, and partly for the practical affairs of life. But sacred science ranks above both; for the sciences that appertain to mental culture hold their rank either from the certainty to which they lead, or from the elevated subjects of which they treat. Whilst all human sciences derive their certainty from the imperfect light of reason alone, heavenly science is based upon the light of divine knowledge, which is subject neither to limit nor illusion. This divine doctrine comprehends things far transcending reason, whilst the rest of the sciences touch upon only what is within its reach. Of the practical sciences, the more excellent is that which has a higher aim in view; therefore does this holy science again transcend all others, inasmuch as it tends to the highest aim, eternal happiness. Hence it is also the highest wisdom. Wisdom, in any art or branch of knowledge, regulates all minor rules of action in conformity with some one leading cause; but sacred science fixes its eye upon the highest cause of the universe, upon God Himself, and from this supreme standpoint, it determines all the rest. The esteem in which an object is held, is always the preliminary condition of love. We may conclude, therefore, from the high esteem St. Thomas entertained for sacred science, with what love and earnestness he devoted himself to it. Once, he was returning with some of his scholars from St. Denis near Paris, where they had venerated the holy relics and visited the monks. As they approached Paris from a point whence they could command a view of the whole city, one of his scholars said to Thomas: “Master, how beautiful is this city, this Paris!”—“Yes, very beautiful,” was the reply. “Would that it belonged to you!”—continued the scholar. “What should I do with it?”—asked Thomas. The other answered: “You could sell it to the King of France and with the proceeds build monasteries for the Friars-Preachers.” But Thomas closed the conversation with: “Indeed, I should far rather have the Homilies of St. Chrysostom upon the Gospel of St. Matthew; for if this city were mine, the care of its management would rob me of leisure for the consideration of heavenly things, and thus mar the peace of my soul.” In the process of canonization, a witness testified that he had heard the above from many, for that word of the holy Master became universally known at Paris. A single work upon God and His kingdom, was more valued by the great Master than the possession of a metropolis. He dreaded temporal goods that might put an obstacle to his study of the highest wisdom. What is my fervor for the things of God? for the knowledge of the divine doctrine of our holy faith and of the Commandments whose observance is a condition for the gaining of eternal life? Is that not truly realized in me which St. Thomas only feared for himself—that earthly possessions and the care of temporal things, might disturb and hinder the flight of his soul into higher regions? Am I not of the number of those that hold all things dearer than the truths revealed by God? And yet these truths are the highest wisdom, since every other science must either subserve this, or become hurtful and absurd. 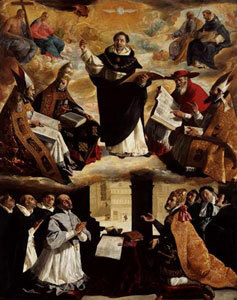 It is, perhaps, my vocation, or at times my secret desire, to devote myself to the priesthood, to the religious life; and yet I do not find in my efforts after knowledge those high aspirations to which St. Thomas so significantly alludes when he calls sacred wisdom the mistress, and all other branches of knowledge her maids. And though I may not be called by God to instruct others, is not a certain degree of knowledge of holy religion necessary to every Christian, to all men, as a condition of love? Does not indifference to what is holy originate in ignorance? Does not the little esteem for religious truths arise from the deplorably superficial treatment they receive? Ought not the deep and solid comprehension of the doctrines and commandments of our holy religion together with the connection existing among them, excite in my breast real enthusiasm for them? In a word, does not my little appreciation of the treasure spring from my ignorance of its worth? Now, how is it with myself? Shall I not act wisely and discreetly by drawing waters from the highest sources? Only the blessing of Heaven confers success. When St. Thomas was appointed to take the degree of Doctor at the University of Paris, his humility was shocked, and he prayed earnestly. During the night, a venerable old man appeared to him, consoled him, and said : “Take no other words than these: Thou waterest the hills from Thy upper rooms: the earth shall be filled with the fruit of Thy work.” That was truly the text most suitable to the great Doctor, for in it lies the prophecy of his success throughout all ages. I will bear in mind the most significant of those words: “From Thy upper rooms.” If every good gift comes from above, from the Father of Light, it must be especially true of that heavenly wisdom which enlightens us upon God and our relations to Him. Gladly will I adopt the views and practice of the holy Master, who declares that books are only the external help, and study only the human condition for acquiring true wisdom; but that enlightenment from on high can alone infuse spirit into the dead letter, can alone render true wisdom attainable. Prayer and unremitting application must go hand in hand, that I may penetrate deeper and deeper into those mysteries that alone are deserving the efforts of an immortal spirit. My eternity will then be the perfecting of what I have begun upon earth: to know God and love Him above all things. “God of my fathers, and Lord of mercy, who hast made all things with Thy word, and by Thy wisdom hast appointed man, that he should have dominion over the creature that was made by Thee, give me wisdom that sitteth by Thy throne, and cast me not off from among Thy children: for I am Thy servant and the Son of Thy handmaid, a weak man, and of short time and falling short of the understanding of judgment and laws. Send her out of Thy holy heaven and from the throne of Thy majesty, that she may be with me and labor with me, that I may know what is acceptable with Thee; for by wisdom they were healed, whosoever have pleased Thee, O Lord, from the beginning.” (Wisdom IX. 1, 2, 4, 5, 10, 19). Thou didst, O Lord, fill Thy servant, St. Thomas, with incomparable, heavenly wisdom, so that in very truth, can the whole Church satiate her hunger with the fruits of his works! Give me a little spark of his illumination signified by the sun upon his breast. Give me a ray of his celestial light that by it my path through life may be lit up and that, if it be Thy holy will, I may enkindle it in others. Pray for me, great and wonderful Master, that I may imitate Thee in this wherein all may follow Thy example, that I may keep my eyes always turned heavenward. As the eagle seizes its young and bears it on high, in order to sharpen its gaze by fixing it upon the sun; so do thou raise me up, that my eyes may now become accustomed to look upon the Sun of eternal brightness and thence to draw eternal happiness. Obtain for me, St. Thomas, what the Church bids me ask on Thy feast: viz., to understand what thou didst teach, and in my life to follow what thou didst practise. Through Christ, our Lord. Amen. Prayer of the Church for the Feast of St. Thomas of Aquin. O God, who by the wonderful learning of blessed Thomas, Thy confessor, hast illustrated Thy Church, and by his virtues hast enlarged it: grant, we beseech Thee, that we may understand what he taught and in our lives follow what he practised. Through Christ, our Lord. Amen. Trait from the Life of St. Thomas of Aquin. In the process of canonization an eye-witness attested that St. Thomas had risen entirely from the earthly to the divine. He used to become so absorbed in lofty thoughts at table that the viands before him might be removed without his remarking it. The following instance of this is recorded: St. Thomas was once invited to the table of St. Louis, King of France, but he excused himself as he was at that time engaged upon his great Summa. The king however, would take no refusal. He obtained from the Prior of the monastery at Paris a command for the holy Master to dine at the royal table. St. Thomas went immediately on the word of his superior, but full of thoughts that had occupied him in his cell. As he was sitting by the king’s side, suddenly a truth flashed upon his mind like a streak of lightning—and he struck the table with his hand exclaiming: Now is the heresy of the Manicheans at an end!”—The Prior, who sat next to him greatly embarrassed, said: “Master Thomas, remember, you are at the table of the King of France!”—and then he seized the saint’s mantle, and shook him till he came to himself. Thomas, understanding what had happened, bowed toward the holy king and begged pardon for having been so absent-minded in his presence. St. Louis was filled with admiration, and thought only of recording the lights that the holy Doctor had drawn from divine inspiration. He sent for his secretary to take down at the saint’s dictation what the Spirit of God had imparted to him. It was a similar love of wisdom that raised both these saints to similar honors in the Church of God. Do thou, also, esteem the teaching of St. Thomas, and thou, too, wilt become holy. This entry was posted in 02. February Devotions, Six Sundays in Honor of St. Thomas of Aquinas. Bookmark the permalink.